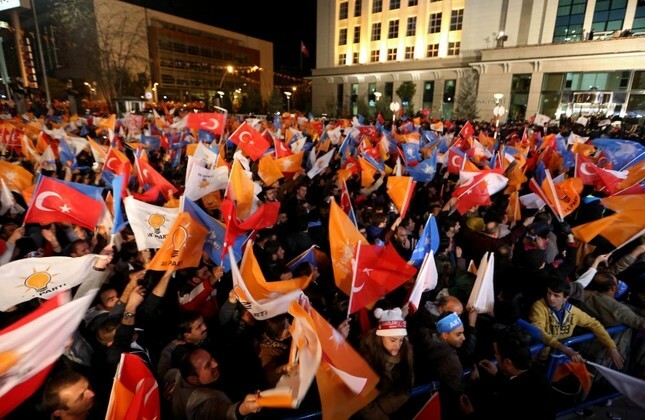 AK Party supporters celebrate after hearing the early results of the elections in front of the party headquarters in Ankara, Nov. 1, 2015. Harvey Voogd once said: "We seem to have a problem with politicians keeping their promises in a timely manner." This proposition points out the great paradox of elective democracy. In a system where one can win as long as he or she can convince the electorate and are able to gain popular support even with lies and deception, what is the benchmark and guarantee for politicians to keep their promises? The answer lies in the paradox. If politicians do not keep their promises, the electorate will eventually punish them by retracting support in the next elections. At least this is theoretically what would be expected in democracy. But elections happen once every four or five years, and what about the years in between? In these relatively long periods, nongovernmental organizations, active citizens, civil society, opposition parties and media are expected to be viable checks tracking and exposing whether politicians are compatible with what they have pledged – again, at least this is what the theory says. But still, we lack any stable mechanism to track political promises in a timely and precise manner. Are they fulfilled within the pledged timeline, realized sufficiently by allocating enough resources and do they work in real life and trigger any real change in ordinary citizens' daily lives? Do the proposed solutions result in expansion of wealth and prosperity of individuals and society? All of these questions bring us to the starting point: All lies have an expiration date, and one cannot cheat the electorate forever. By definition, citizens are rational actors in democracy. As long as ordinary citizens cannot feel change in their daily lives for the better and are not persuaded about prosperity existing, emerging or coming, no politician can win all elections in a working elective democracy. Understanding the Turkish phenomenon, I want to place Turkey in the context of this theoretical introduction. In the past 15 years in Turkey, the ruling Justice and Development Party (AK Party) has won 11 consecutive elections and referendums, being able to form a single-party government in 10 of them. In the last election in November 2015, the party received 49.5 percent of the vote with almost 24 million votes in the party's highest rate ever – also for any party in the history of the Republic of Turkey. In this year's April 16 referendum, with 1.7 million more votes in favor, the party won again. So, what is happening in Turkey? It is a mystery to be solved for many Europeans and for many political scientists. Why does the Turkish electorate consistently vote for the AK Party? Why does the party expend its political base despite many instances of popular unrest and political disputes in recent years? Why do large blocs maintain support for the government so strongly despite much Western criticism over lack of democracy and liberal freedoms? What is the secret to building such a strong bond with these voting blocs in a country where political instability, weak coalitions and early elections was the standard during the 1990s and the early 2000s? How is the future of a country designed solely by elections in the region of the Middle East, where political stability has long been forgotten, electoral systems do not work and violence has become the sole method to solve problems? Is it the genius of cunning politicians who are constantly finding new ways to shepherd the herd or is this 15-year-old political story connected to a deeper social current? Let's be straightforward and ask honestly and ignorantly as many Europeans do: What madness leads Turks to keep voting for the AK Party? From the frontline of political scientists, several explanations are emerging to answer this question: Some essentialists dove into rash conclusions that the consecutive successes of the AK Party, and its leader President Recep Tayyip Erdoğan, shows that so-called Middle Eastern societies have an inherit tendency toward autocratic and charismatic leadership. For them, this is the only logical explanation, and this logic eventually and inevitably leads us to the idea that democracy is something specific to European societies and cannot be recreated outside the West. Some more liberal academics who have rescued themselves from Eurocentric logic get help from political science literature. Some theories in the literature, such as the hegemonic party theory or the authoritarian democracy theory, are used to explain the Turkish phenomenon. Alongside this, some others are reinventing and utilizing the concept of illiberal democracy to scrutinize the dynamics in Turkey. Despite the contributions of these theoretical approaches to expand the ground of the debate, none of them are sufficient to explain the simple question of how a party can win 11 successive elections. How and through which mechanisms has this been achieved? With what kind of a political behavior does the Turkish electorate bond itself with that strongly to a party? What are the political themes and issues that define ordinary Turkish citizens' voting behavior? To understand the bigger picture with a particularistic approach, I focus on the AK Party's policy programs one at a time. In this sense, I propose to look for a strategic piece of the AK Party's policies and programs, i.e., the social policies in Turkey under the AK Party. In fact, the case of Turkey's social policies in the past 15 years presents a great opportunity to inform about Turkey. Social policy is a good topic to track and discuss the AK Party's legacy and to extend political science discussions over Turkey for a couple of reasons. First, from its foundation, it has been one of the main components of the AK Party's election manifestos and political promises. Second, as I will elaborate further, these policies have created a bond between the electorate and the party in the long term, both on the emotional and material level. Third, as social policies are public policies that touch the daily lives of the electorate directly, scrutinizing the case of social policies helps us understand the strategic voting behavior of the average Turkish electorate. Social policies have been a key aspect in the AK Party gaining and maintaining votes from large blocs of society. However, this is not a way of bribing the electorate, as some analysts falsely say. Some analysts misinterpret the case, saying the party bribes the poor and vulnerable with the distribution of basic needs such as food, coal and furniture with a populist approach just prior to elections. Presenting the social policies of Turkey in the past 15 years as political bribes is a false evaluation of the factuality on the ground for a few reasons. First, the AK Party does not apply or accelerate social policies just before elections, but constantly and long term. Secondly, the party has held this aspect of its political legacy as a priority from the very beginning, so social policies are long-term political tools in the mentality of party leaders rather than short-term schemes to win elections. Third, social policies in Turkey do not just consist of populist approaches such as distributing pasta, coal or refrigerators to the most vulnerable. Just the opposite; during its governments, the AK Party has implemented several social policy programs, many of them structural, reformative and universal, including expanding social security allocations, ensuring quality healthcare for all, reforming the social services system, implementing general health insurance, free transportation for the elderly and the expansion of quality care facilities. We should not think of Turkish voters as weak-minded, able to be cheated by a couple lumps of coal or a pile of pasta, but as rational actors, as the theory suggests. One might win a single election with these cheesy tactics, but it is quite a cheap argument to explain 11 election victories in a row. Instead, the phenomenon is much more complex. Large voting blocs in Turkey feel the results of the AK Party's social policies in their daily lives. The electorate does not act with mindless reflexes nor is it deceived with cheap bribes, as it instead acts very rationally and strategically in the case of welfare provision. Social policies are the long-term policy solutions that have built the practical bond between the political current of the AK Party and large voting blocs both on the emotional and material level. For instance, Adil Gür, from the respected A&G public opinion research company, said that according to their research, the AK Party gets 4 percent to 6 percent of the vote just from satisfaction in healthcare and welfare services. He also said that the AK Party garners more votes than the average from housewives and explains this phenomenon with this voter group due to them feeling improvements in welfare services directly in their daily lives. One of the main themes in Erdoğan's speeches has always been the protection of the "garip gureba fakir fukara." This very symbolic Turkish term refers to the poor and vulnerable sections of society who are in poverty and misery and who have been neglected for decades. By upholding extensive social policies, the AK Party has brought a new opportunity to these vulnerable sections of society to cling to life again. In other words, vulnerable sections of society are directly and highly attracted to the party since they gain the most from the expansion and deepening of social policies. This drives them to maintain and increase their support for the AK Party. Ordinary citizens connect themselves on an emotional and material level with this political party that has designed, implemented and created these policies, involved in strategic voting behavior. This point also answers another paradox in Turkish politics that social democrats gain votes from the upper classes, while Muslim democrats gain the vote of the lower classes. That is a contrary fact to the theory and practice of politics in Europe. In Turkey, while a Muslim, democrat, right-wing party sweeps almost 70 percent of the vote in the poorest districts of Istanbul such as Bağcılar, Eyüp, Gaziosmanpaşa and Sultanbeyli, the social democrat, opposition Republican People's Party (CHP) does the very same in the most elite and richest neighborhoods of Istanbul such as Etiler, Nişantaşı, Bebek and Beşiktaş. Gaining the hearts and minds of vulnerable and poor sections of Turkish society is one of the main reasons for the AK Party's 11 consecutive election victories over the past 15 years.